← ASK FATHER: One Mass for the obligation for Sunday, Christmas Eve and Monday, Christmas Day? 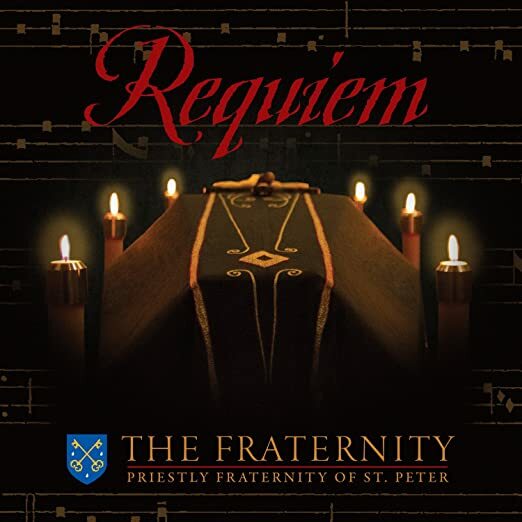 There is a video about the new Gregorian chant disc released not long ago by the FSSP, with chants for the Requiem Mass. “Gregorian Chant has found a new audience.”, the voice over says towards the end of the video. It seems that every time one of these discs comes out, it hits the charts and stays there. I remember when the disc from the monks of Silos came out. People went bananas. The wonderful discs of the Benedictine Sisters in Missouri have also been best sellers. At the same time… GRRRRR! Generations have been robbed robbed ROBBED! Cheated of their patrimony! The libs who controlled the interpretation of the Council on liturgy and music stole from us our treasury of sacred music and, in doing so, opened our liturgical worship up to tinkeritis and ditties so bad that not even a radical cephalectomy could remove the bad taste. When they destroyed Latin worship, the doors of our treasury were slammed shut and, into the vacuum, rushed slapped together dreck inspired by commercial jingles and sitcom tunes. I would like for one of these groups systematically to record the chants for ordinaries and propers for feasts. Here is the disc in question. It would be a great gift. This entry was posted in Liturgy Science Theatre 3000, Pò sì jiù, Wherein Fr. Z Rants and tagged Denton, FSSP, Gregorian chant. Bookmark the permalink. 11 Responses to VIDEO: FSSP Gregorian Chant disc. Wherein Fr. Z rants. It is ironic that everyone in the world knows what Catholic liturgical music is and what it sounds like, except for our own people, with seemingly rare exception. @Deacon John. Agreed. This seems to be doubly true when it comes to “liturgists”. It’s ironic that movie makers in Hollywood know well that to put the viewer “in church” the music is either pipe organ or chant. The Church post-V2 and the NO Mass are opposed to the memory and identity “made present” by tradition. To be against tradition is post-Catholic, and utterly foolish. It is odd that “contemporary-Kirk” people from the “1960-70s groupthink” think don’t realize that everything done in the 1960-70s is just like everything done in every age – that is – most of it is mediocre and superficial and culturally-bound to the 60-70s – and is thus junk. Only the most beautiful things pass the test of time – and the 60-70s kulturkampf group wants to suffocate the transcendent and replace it with a junk non-culture. I recently purchased the complete set of CDs from the Benedictines of Mary, Queen of Apostles (the order in Missouri to whom Father refers). I have only listened to the Advent CD, but it is excellent. It is well-sung, without being too operatic (my chief complaint with opera singing is that is seems as though — in the pursuit of a “pure” sound — all consonants are dropped and all vowels are opened up to Os, rendering the words unintelligible), but also without being too ossified and boring (as some chant tends to be sung, as though the notes need to be dragged, unwilling, through 1000 years of space-time to make it to today’s ears). And it is not simply Gregorian chant — it is a nice mix of Latin and vernacular songs. Unlike other chant CDs, this one is getting repeated hearings from me. I am 40 years old, unfamiliar with much of my Church’s patrimony, and trying to take steps to discover it without getting overwhelmed; this Advent CD, as crazy as it may sound, is actually helping me a lot with that. I have always been amazed at how diligent the Ruthenian Metropolitan Archeparchy has been, through their Metropolitan Cantor Institute, in keeping alive their chant tradition. Yes, there have been some odd changes, and yes it tends to be a bit more like “plain-chant”; but nonetheless, they have maintained a good portion of their heritage. There is no comparison between it and what was permitted in the Roman Rite. It will remain a testimony to their episcopacy that during the darkest years when, at the same time but in the West, Roman bishops allowed the venerable Roman Rite and her liturgical traditions to be dismantled, the Ruthenian eparchs (and the bishops of other eastern ritual churches as well) did not allow their own liturgical traditions to be pulverized into dust. How the much wealthier Roman world did not invest in resources to expand the gregorian tradition (as SC called for) seems to me to be a testimony to grave deficiencies in faith (or, in liturgical piety at the very least). In these matters, the West could learn some lessons from the East. I first became introduced to the great Catholic music tradition at an Anglo-Catholic Episcopal church where I heard not only Gregorian chant but great Catholic hymns such as the Pange Lingua. I then reverted to the Catholic Church and for 10 years heard nothing but the “gather us in” type of 1970’s junk. It wasn’t until I started regularly attending the TLM in 2009 that I heard authentic Catholic music again. Thanks to God for those people who have dedicated their lives and given of their time and talent and resources to teach us Gregorian Chant. And to those brave pastors who have been so generous as to make such knowledge available to those not in their parish.